Chevron Parkland is situated on the Swan River foreshore alongside the new Optus Stadium. There, you can enjoy the natural surrounds as your kids balance up high through the Qwandong Towers, meander through the Yaargan Dry Creek, step across the Deep Gorge, creep through the Numbat Burrows and ascend the Bullung Hangout. Developed with input from the Whadjuk community, this vast space is inspired by the Noongar six seasons and features ten permanent 3D artworks by emerging WA Noongar artists. 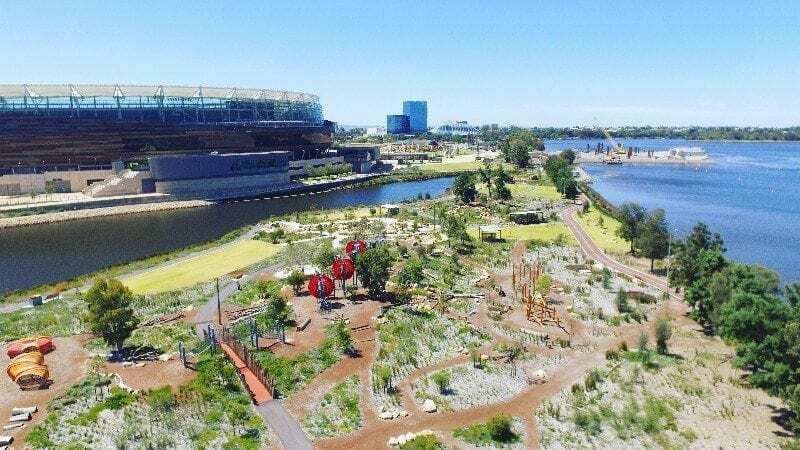 The Chevron Parkland sprawls over 2.6 hectares of rehabilitated land, with a wide range of engaging nature play elements for kids Chevron Parkland is overlooked by Optus (Perth) Stadium, is spread across 6 acres of rehabilitated parklands and features several adventure and nature based play areas. You'll love exploring this unique natural environment that is rich in environmental and aboriginal culture.